High Mileage Oil - well over 300,000 miles! MUST SEE! What do you do when your car accumulates over 300,000 Miles? Kenneth Lindland gave his to AMSOIL! Kenneth Lindland, a retired preacher from Grass Lake, Michigan, didn’t really know what he was getting into when he purchased his used 1985 Pontiac Parisienne from his wife Agnes’ brother in 1989. At that time, the car had just over 57,000 miles on it, and Lindland said he would be happy if the car simply held together until 137,000 miles. Because the car kept running dependably past all of his benchmarks after becoming fully depreciated, Lindland realized that the car was actually making him money at the depreciation figure of 10 cents per mile. By the time it had accumulated over 330,000 miles, Lindland decided it had saved him the nearly $20,000 he would have spent on acquiring a new car. So when it came time for the Lindlands to purchase a motor home, those savings were instrumental in the decisionto make the purchase. “This Pontiac actually bought our motor home for us debt free,” Lindland said. Although the car has accumulated more than 340,000 miles, the engine and transmission are in remarkably good shape. In fact, it ran so well through the years that the head was never removed for any repairs. Lindland had a compression test done on the vehicle in December 2000, and could barely believe the results. The highest and lowest recorded cylinder pres-sures were only eight pounds apart. Unfortunately, all good things must come to an end. Although the car seemed to have many miles left to travel, Lindland’s wife Agnes finally convinced him that it was time to purchase a newer car. “The longer he had the vehicle,” she said “the harder it was to make him get rid of it.” It was with great reluctance on Kenneth’s part that the Lindlands purchased another car. With appreciation they gave their Parisienne to AMSOIL INC. “I feel very indebted to AMSOIL,”Lindland said. “No way would this car have given us this fine service with conventional oils.” The Lindlands drove up the 700 miles from Grass Lake, Michigan, to Superior, Wisconsin, to deliver their Parisienne to Superior on June 26, 2001. The car is now being driven by an AMSOIL employee to see how many more miles can be added to the 340,000. Another satisfied Amsoil customer goes 362,000 and only 15 oil changes on Amsoil. See this Geo Prizm owner as well as a Honda owner who started Amsoil at 195,000 miles. If you're ever in Boca Raton, stop by. 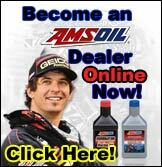 Another great Amsoil dealer: Amsoil Gary, Indiana or Tamarac as well.